Partners for a Hunger-Free Oregon believes that everyone has the right to be free from hunger. We support and advocate for public policy that will increase economic stability, strengthen our food system and increase access to the food assistance safety net on the local, state and federal levels. Everyone deserves a safe, affordable place to call home. Yet renters in Oregon are seven times more likely to experience hunger than homeowners. This measure removes an outdated restriction in Oregon’s constitution that makes it hard to create affordable housing using public-private partnerships. The amendment is a bipartisan solution to help local communities create more affordable housing for families, seniors, veterans, and people with disabilities throughout Oregon. Oregonians deserve high quality schools and public services so everyone can thrive. Measure 103 goes in the wrong direction – it’s untested, misleading, and risky. Proponents want you to believe Measure 103 is about grocery taxes. Don’t fall for it. There is currently no viable proposal to put a sales tax on groceries in Oregon (we would oppose such a proposal, for the record), and there likely never will be. When you look beyond the slogans, this measure is changing Oregon’s constitution to create permanent future corporate tax loopholes. The measure is written so broadly that a tax prohibition would apply to food products sold for e-Cigarettes and marijuana edibles, as well as food sold at movie theaters and sports arenas. It would apply to Oregon’s fuel and mileage tax, and to Oregon’s Corporate Minimum Tax. Cities and towns would be prohibited from enacting taxes on sugary beverages, which could help fund investments to communities. Moreover, as anti-hunger advocates, we feel it is our obligation to speak out when we see campaigns who are using the faces of hunger to their own advantage. When you look beyond the slogans, this campaign seems designed to help special interests more than people buying groceries. The Oregonian: Voters should steer clear of Measure 103 and its many unintended consequences and vote no. Measure 104 makes it harder for Oregon to fund schools and human services by making it harder to close tax loopholes. It would do this by by amending Oregon’s constitution to require a 60% “supermajority” of the legislature to close tax loopholes (it’s currently 50%). We know from experience that when state budgets are tight, cuts to child care and work-supports for Oregonians with low incomes are the first on the chopping block. We have an idea – why not make it more difficult for the legislature to cut services like child care for working families? 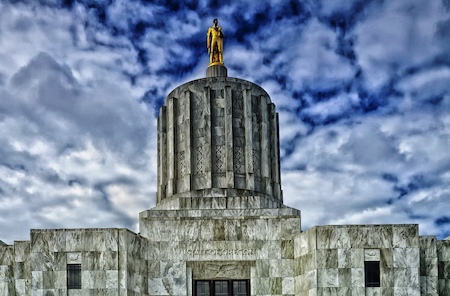 The Oregonian: It doesn’t guarantee bipartisanship or good policy. It only gives lobbyists seeking to block legislation an easier path to do so. We stand in solidarity with Oregon’s immigrant communities in strongly opposing Measure 105. Measure 105 would increase racial profiling in Oregon and heighten fear in communities already experiencing high levels of distress. It would do so by repealing Oregon’s successful Sanctuary Law. The law – passed nearly unanimously over 30 years ago – gives clear guidance to local police on how to handle complex immigration issues. The law has helped reduce racial profiling while keeping local police focused on protecting local communities. If Measure 105 passes, Oregon will be left without any of these important protections and this guidance. The Oregonian: Oregonians should stand together against racial profiling and reject changes to a law that keeps us all safe. Oregon is facing an affordable housing crisis. When housing costs are high, household budgets for nutritious food are squeezed. Increasing the supply of housing is necessary for Oregon’s growing population and is one important factor in keeping housing affordable. The regional affordable housing bond will build new affordable homes and renovate existing homes for over 7,500 people in the region in need of safe, affordable housing, or up to 12,000 people if the statewide measure passes as well. This measure is the result of a community-led vision to provide family-wage jobs that build a green economy. It would do so by raising revenue on very large businesses – groceries and medicine would be exempted. The initiative would bring in $30 million per year for renewable energy projects, living-wage jobs and apprenticeships in clean energy, housing upgrades, and more. Portland Clean Energy Fund is Portland’s first-ever people of color-led environmental initiative. It is structured to particularly benefit communities of color by investing in job training and family-wage jobs with an environmental justice lens. We got some bad news this week, and there isn't really any way to sugarcoat it.